I've been in London over the last couple of weeks doing work experience at the Guardian as part of their Positive Action Scheme. I was meant to start another week of work experience in Bristol on Monday, but I got struck down with the 'flu and spent the weekend in bed, instead of on trains to Bristol ): Mum kindly drove me back to Bristol on Monday, where I proceeded to collapse in bed for another couple of days. Ugh. I'm hoping to start my work experience at Who Do You Think You Are? magazine tomorrow (perhaps armed with a pile of paracetamol since my head is refusing to stop aching). Anyway, let's talk a bit about the Guardian! So over the two weeks I spent a couple of days at five desks (G2, Multimedia, Society, Travel and Culture) doing a variety of things. My personal highlight was cutting up clips of Edward Snowden for use as syndicated content. It was a pretty simple task, but being able to watch all that footage (four hours!) was an incredible insight into Snowden's life. I also got to do some writing and had a little piece about the cabinet reshuffle published in last Wednesday's Society section (eee, a byline! ), as well as some little bits in Saturday's Travel pull-out. It was pretty fun getting to write content on such a wide range of topics - from surfing to salamanders to Sinead O'Connor. Not all of it got published but I got some really useful feedback. 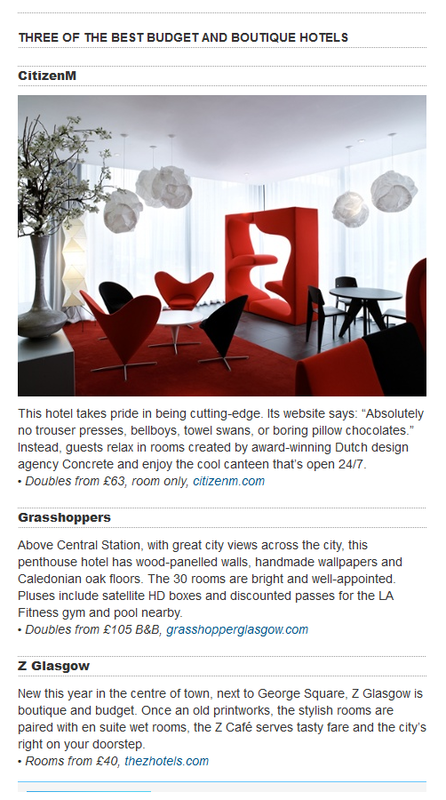 CitizenM and Z Glasgow reviews by me - I claim no credit for the Grasshoppers one! I've been hard at work on my project, which I am very close to making public - just waiting on the last couple of interviews to be done before I release the site for testing. I really wanted to share some of what I've done with you all, so I've put a video up on Youtube. To give you a little bit more context, my final project is about the new Computing curriculum in English schools and the outreach that is being done to get kids interested in Computer Science. I wanted to keep the feature quite general, so it would be the kind of piece that could slot in to the features section of a national news website, rather than being specifically tailored to a technical audience. In order to achieve this, I had to explain what CS is. Throughout my undergrad degree, I often had people asking me what I even learnt...so who better to explain than crytographer extraordinaire, Nigel Smart? One of the important things with a large multimedia feature is to have a variety of page elements - I didn't want it all to be text, but I also didn't want every section to have the same format. I thought I'd experiment and try making an audio slideshow - a great way of showcasing some photos and getting Nigel's point across without making people read swathes of text. If you're interested in checking out some more audio slideshows, I would recommend the Guardian's poetic piece about Van Gogh. My tutor suggested looking at Ciara Leeming's work, which is simply beautiful, definitely worth viewing!